In endurance sports, there is no shortage of amazing stories. At every turn, we are surrounded by stories of people overcoming incredible challenges through the discipline of endurance sports. Be it mental health, addiction, physical limitations or personal tragedy, many people have turned to endurance sports for help. I love hearing these stories as they remind me that all this splashing, pedaling, and running around I do can be so much more than simple exercise. It makes me feel as though the sport I love so much is part of something larger. However, I have occasionally felt that a certain effect is lost when viewing these stories from a distance. The inspirational feeling that results from hearing someone tell their amazing story can fade quickly after reading or viewing their presentation. Often, we don’t know these people personally, so while their story is immediately impactful, those feelings aren’t reinforced beyond the initial telling. This is where I have had an incredible privilege over the last three years or so. I have been part of an inspirational story happening right under my own roof. My Mom, Dorald “Dee” Turner, has undergone a life altering transformation that truly must be seen to be believed, and I am so proud to have even had a small role to play in this story. I sat down recently to interview her to get her thoughts on where she’s come from and where she’s going. This story begs to be told, and while it may seem similar to so many others you have read, it has some very subtle, yet important, lessons to teach about the power of personal effort. The roots of this story lie, perhaps unexpectedly, not in endurance sports. In the early part of 2015, my Mom’s weight sits about four hundred and twenty pounds. She cannot run due to extensive damage to her knees, her body prevents her from getting onto a bike, and her lack of self-confidence bars her from getting into a pool. That number, four hundred and twenty pounds, bears remembering, because it’s going to become important very shortly. Fast forward to a date that she marks very specifically, October 18, 2015. She explains to me that this was the date of her first information session. Having already made drastic diet and lifestyle changes, she decided that her next steps were inside a selective weight loss program through Holy Cross Hospital. At this meeting, she learns all the requirements she will have to meet to qualify for her ultimate goal, a gastric bypass surgery. This surgery would decrease the size of her stomach allowing her to attain the drastic weight reduction that was needed to safeguard her health. In addition to further weight loss as a requirement of this program, she would be required to attend two ninety-minute weight loss courses, two three-hour infoormation sessions, several mental health screenings, numerous nutritionist appointments, and submit detailed food journals for her six to nine month attendance in the program. At the end of which, her case would be presented to a panel of doctors to ultimately decide whether to approve her for the surgery. The ferocity with which my Mom took on this challenge was astounding. She underwent what she described as a, “total lifestyle change both physically and mentally.” She attended her first official meeting in November of 2015, and she was off to the races. 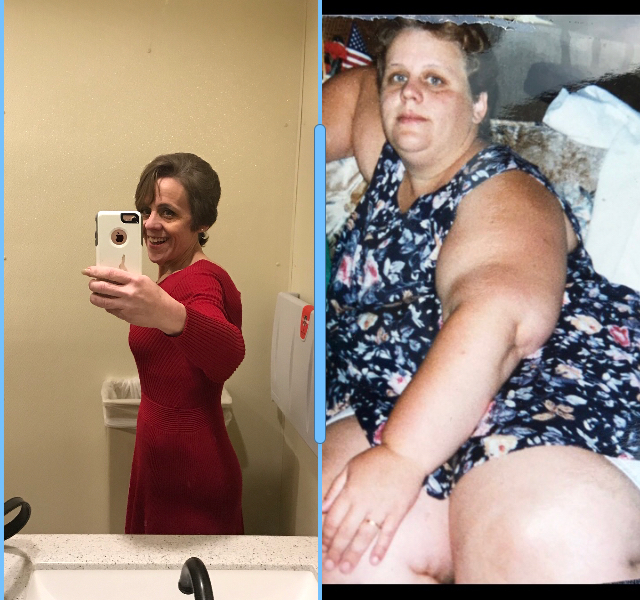 She passed all her initial screenings with flying colors, and she managed to lose eighty more pounds during her time in the program even before the surgery. After recovery, she made quick use of her independence; she continued and even built on the lifestyle changes made within the program, completed three five-kilometer races, and became a spokesperson for her program. She has been invited to numerous meetings to speak to potential members and offer her story as a beacon of hope. She’s quietly made herself a resource to the other alumni of the program and helps to keep wavering members from losing their way when the post-surgery life gets more complicated. All this progress still rings through today. At the time of writing, my Mom sits at one hundred and thirty-eight pounds. A total weight loss of about two hundred and eighty pounds. As we sit together in her kitchen in Western Maryland for the interview, she informs me proudly that she has logged two years straight in her food journal app as of that date. She tells me with an unmistakable glimmer in her eye about her plans for the future. She has already registered for several more five-kilometer races, an all women eight-kilometer race, and she will make her outdoor triathlon debut this June as her and I race together at the Escape the Cape Triathlon Series in Cape May, New Jersey. For my final question of our evening interview, I asked my Mom which steps of a race did she think were the most important, the first ones or the last ones. True to form, she picked the last ones. She remarked that the last ones are where you learn the most. I would contend that they are also where you have the greatest opportunity to teach. This, I believe, is the true power of my Mom’s story. There have been so many finish lines for this journey of hers, many opportunities for her to be “done,” and yet she continues to use her journey to teach and inspire. She has recognized that while a journey may end at some destination, the echoes of that final footfall ripple into something so much larger than can be seen. I think that her story teaches that the true power of endurance sports, or any undertaking for that matter, come from mindful participation, deliberate effort, and an awareness of the effect we can have on others.